I was surprised when a website told me a new restaurant in Fort Dodge had put a super-jumbo tenderloin on the menu. It claimed to serve a full pound size tenderloin. This had previously been a size only offered at the St. Olaf Tap in Northeast Iowa. The local paper tells me that the owner of this place promotes Country music concerts, and an outdoors multimedia project including a television show, radio, and magazine. The Roadhouse Bar & Grill offers more opportunity for tie-in events. Location: the address is listed at 217 S 25th St, inside the Crossroads Mall in Fort Dodge. Directions: This place has two entrances at the northeast corner of the Mall, you get there by taking the Business Route of Highway 20 which is 5th Ave South in Fort Dodge. 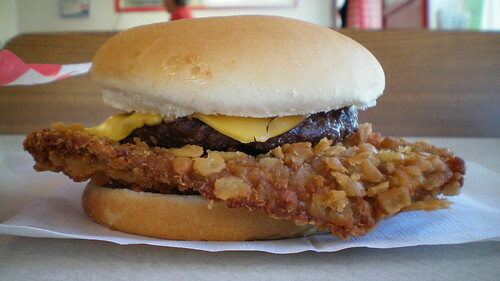 The Tenderloin: Listen on the menu as The Big Country 1 lb. Tenderloin (Huge - Bring a friend!). First things first, this thing is big. It may not have been a full sixteen ounces before breading and frying, but it felt huge and was filling. A big problem with giant tenderloins is getting the huge cuts of pork to stay consistently tender and moist after cooking. The giant cut of meat just gets too tough, dry and chewy. The breading added more than enough crunch, but most of the flavor came from the red onions underneath the bun. Some more seasonings could raise the score, but it also needs to be more tender. Overall 6.5 out of ten. Price: $8.99 with a side of fries. Sometimes it will be on special for a dollar less with a soft drink. Service: Its table service at the booth seats, or you can sit at the bar. Ambiance: This location used to be a Cactus Bob's Tex-Mex restaurant, so there is wood paneling with signs. The new ownership has put up pictures of country music acts. Also on the menu: There are burgers, the nachos look special, and the "self proclaimed best wings in the Midwest"
Final Thoughts: I hope this place sticks around because the wings were good. You can check out a YouTube video from a wing eating contest captured by the local paper. On my next trip through Fort Dodge, I will try to make it to the often recommended Community Tap & Pizza and try their tenderloin. I was just at the Roadhouse this week and had the Tenderloin. Thanks for the post! The bun has changed for the better and the kitchen took your advise because my tenderloin was cooked perfect and had a dusting of some kind of seasoning salt. Its cooked for a shorter amount of time due to the relative thin-ness of the tenderloin and the cracker breading. It is now served on a lightly buttered and toasted, corn dusted bun! It is still served with lettuce, tomato, red onion and sliced pickles. Hope u come back to try it again! We're glad u love the wings! I went to fort dodge and decided to try this place out. Good Atmosphere and i too loved the wings. Tenderloin was great too but my wife and kids had to help me eat it!